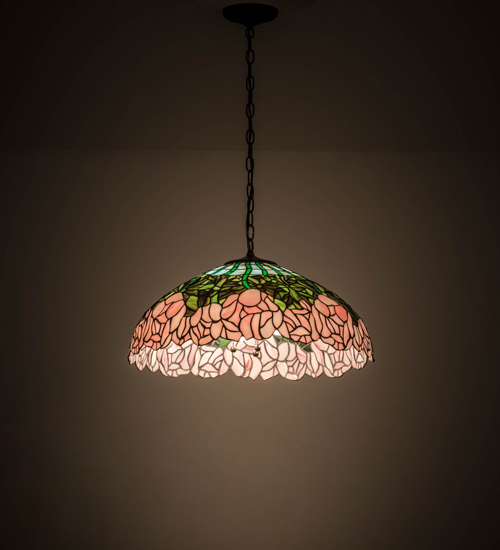 Description: A wreath of full blooming Passion Pink cabbage roses circle this beautiful stained glass shade in a design inspired by the Louis Comfort Tiffany studio. Bronzed Green leaves and stems form a pattern against an Opal sky in this lovely Mahogany Bronze finished pendant. Custom options include special colors, styles, sizes and dimmable lamping options. This pendant is UL and cUL listed for damp and dry locations.